1	Preheat oven to 425°F. Line a baking sheet with parchment paper or a silicone mat and set aside. 2	In the bowl of a stand mixer or a large bowl, combine the warm water and yeast and let sit for 3 minutes. 3	Stir in sugar and salt. Slowly stir in the red wheat flour until the pretzel dough comes together and is not too sticky. Knead the dough (either by hand or with the mixer's dough hook) in the bowl until the dough is smooth but not overworked, about 3-5 minutes. 4	Turn the dough ball onto a lightly floured surface. Using a sharp knife, cut the dough into four equal parts. Cut each part into four more equal parts, for a total of 16 balls of dough. 5	To form the pretzels, roll one of the balls of dough into a long thin rope. Put the two ends of the rope next to each other to form a tight U shape. Twist the ends together once so the twist is about half way down the U. Bring the two loose ends down to the loop at the bottom below the twist. Tuck the two ends under the loop and press so the dough adheres to itself. Gently pull on the pretzel so the dough becomes thinner and the pretzel becomes larger to form a nicely sized pretzel. 6	As for other shapes, you can bake the ropes for pretzels sticks, knot the ropes for pretzel knots, cut the ropes into little equal sized pieces for pretzel bites, or roll the dough into balls and scour the top for pretzel rolls. 7	Lay the pretzels on the prepared baking sheet and spray with cooking spray (this helps the toppings stick). 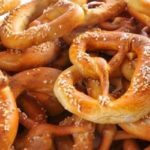 Dip the sprayed pretzels in a shallow bowl filled with your topping of choice (salt or cinnamon sugar) and place back on the baking sheet. Bake in the oven at 425°F for 10 minutes, then broil for 30 seconds or until golden. 8	Enjoy these delicious and healthy pretzels!